Besides the employer and insurance company, doctors play an important role in providing necessary medical information to the New York State Workers’ Compensation Board. Many compensation claims may rely on what is reported in the doctor’s narrative in regards to the workplace injury or illness that the employee sustained. In addition to helping employees receive compensation for lost wages, the doctor’s report also prevents worker compensation fraud. Doctors who administer care can file the new Doctor’s Narrative report, or EC-4NARR, to provide an account of their initial medical care and possible continued care for injured worker. A doctor can use the EC-4NARR in place of filing the Initial Doctor Report (C-4) as well as the Progress Report (C-4.2). The form streamlines the filing process for the doctor and cuts down on the amount of paperwork that must be sent to the Workers’ Compensation Board. However, the EC-4NARR does not replace the doctor’s report for a worker who has a permanent impairment or is seeking a compensation claim to receive payment that goes to special services costing over $100,000. The EC-4NARR also requires the doctor to provide their opinion in regards to the worker’s injury or illness. They will indicate whether they believe the injury or illness is a temporary impairment, whether the details of the workplace accident are consistent with the injury or illness the worker sustained , and if the patient’s medical history for the injury or illness align with the doctor’s objective findings. The narrative report must be electronically submitted by the doctor to the Board. The insurance carrier and the employee’s legal representative (if he or she hired one) will also receive the report. If the employee doesn’t have an attorney handling the case, they will be sent the report instead. If the doctor fails to send in the EC-4NARR, it can affect a worker’s compensation claim. 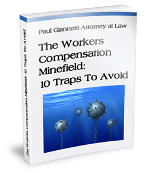 The employee may not receive their benefits for lost wages in a timely manner. Also, the doctor can experience a delay in payment for the necessary treatment offered to the worker and can lose their Workers’ Compensation Board authorization. If you are filing a workers’ compensation claim and received medical treatment from a doctor, you are probably wondering what input you have when it comes to the doctor filing the EC-4NARR form. The doctor will not consult you on what they will place in their medical narrative regarding your injury or illness. You will only find out the information after it has been sent to you, the insurance company and the Workers’ Compensation Board. If you feel that the included information on the doctor’s narrative may have impacted your benefits for lost wages, you still have rights. A professional workers’ compensation attorney can help analyze your claim’s case and determine the best course of action available to you. Call New York attorney Paul Giannetti for a free consultation at (866) 868-2960, or fill out the online form.